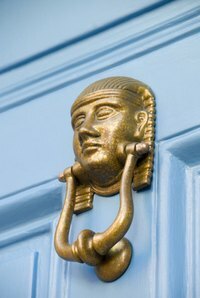 Adding a knocker to your front door adds beauty and functionality. If your door is hollow metal without any fill, the best way to mount the knocker is a through a door mount. Stove bolts and full-thread bolts are ideal for this type of knocker installation. Measure the thickness of your door before you install the knocker. Most exterior doors are 1 3/4 inch thick. This way you will get the proper size bolts for your door. Also look for knocker kits that have threaded sleeves instead of mounting holes. These look and fit better on hollow doors. Position the knocker template on the door and mark the center of each mounting hole with a pencil. Place the tip of an awl on the mark and tap the awl with a hammer. This will keep the drill bit from walking across the door when you first start drilling. Drill small pilot holes through the door at the marks with a bit half the size necessary for the knocker. Place an appropriate-size bit for the mounting sleeves. Expand the mounting holes to size, using the correct bit and drilling from both sides of the door. Drill halfway through the outside and then halfway through the inside. This will prevent unsightly burrs. Place the door knocker into position on the outside of the door, enlisting the help of a friend. The door knocker sleeves should fit into the holes on the outside of the door and the knocker should sit flush against the door. Your friend should hold the knocker in place while you thread the securing bolts from the inside of the door. Thread the threaded screws into the sleeves from the inside of the door. Tighten the screws with a Phillips-head screwdriver or nut driver, depending on the screw head. The screws should be tight but not enough to damage the door. If you are using threaded rods, insert them into the door knocker before placing it on the door. Thread the acorn nuts on the end of the rods and tighten with a nut driver.